Stephen Garvey, leader of the NCA, speaking during the Apple Blossom parade earlier this year. The National Citizen’s Alliance has had its “Public Discussion on Mass Immigration” event cancelled due to controversy surrounding the anti-immigration party. 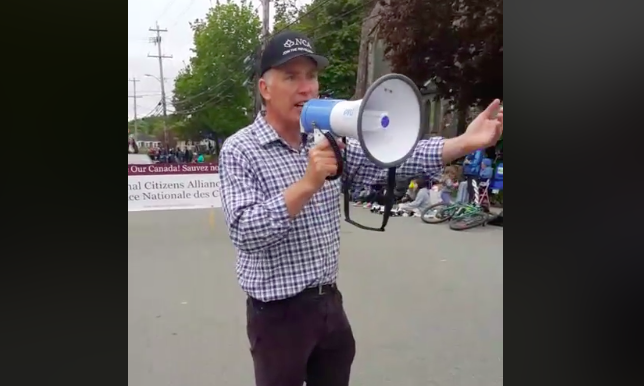 The NCA, an unregistered right-wing party, has been garnering controversy over the past year, having been banned from the Annapolis Valley Blossom Festival after promoting its platform in the festival’s parade. The group also had a follow-up meeting and rally in Halifax cancelled after protest. However, Lion’s Club member Wallace Thompson has a different story. He said the Lion’s Club originally had no idea who the NCA were. When they learned about the party’s rhetoric, they withdrew from their contract. “We don’t affiliate with any politics or religion,” says Thompson. He also says there were no direct threats of protest made to the club. The NCA party has been affiliated with a white nationalist group called the Council of European Canadians, which is dedicated to preserving “Euro-Canadian” culture. The group is listed as an associated organization on the NCA’s website. Garvey has echoed similar views in his speeches, where he stokes fears about the “extinction” of European Canadians. The NCA says it plans to continue organizing events and is planning a convention for the spring.